Modern Thai by the river. 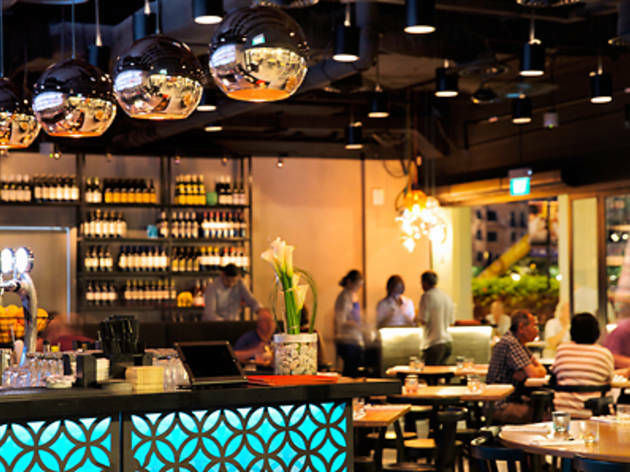 Open on a stretch already populated with plenty of brunch friendly cafés and Japanese joints, slick new Thai eatery Soi 60 adds welcomed diversity to Robertson Quay. 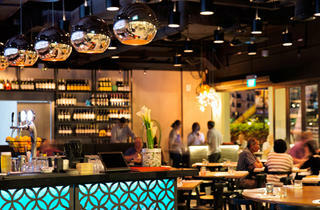 The industrial-chic restaurant offers modern Thai plates and drinks, catering to the afterwork crowd. The space is pretty spare – black metal and concrete furnishings dominate – save for the bright turquoise bar decorated with Asian motifs. And as the restaurant design suggests, food plays second fiddle to the drinks. The concise page-long food menu is a mix of both hits and misses. Comfort classics like the creamy panang curry ($30) are well executed. Sweet and rich but not overwhelming, the curry features a hulking beef short rib large enough to satisfy even the most serious carnivores. Less successful are the salads and cold dishes, which lack finesse. The roast duck salad with lychee ($24) fell flat – it wasn’t dressed with nearly enough zippy black vinegar. And the betel leaves with grilled prawns ($13) was no better, featuring a filling of raw lime rind so roughly chopped, the bitterness threw the whole dish out of balance. Drinks such as the tamarind sour ($18) – a blend of Makers Mark and just enough puckery tamarind pulp – are a safer bet, showcasing smart combinations of Asian flavours and spirits. They’ve got a good selection of easy drinking wines, which are pretty affordable (from $10/glass) too.